Tactical versions of the venerable AK47 platform always hit a soft spot with me, as I love taking an arguably rough and simple platform and making it utterly complicated. Luckily, I'm not alone in loving this idea, as there are a ton of different variations on this theme on the market. One of the newest replicas is this, the JG "MAG-K" (my title, not theirs). It is clearly visually aping the Magpul/Beta Project MAG-K, but without any parts which would require licensing, which is a smart move on JG's part. Keep reading for my thoughts on this awesome AEG platform! 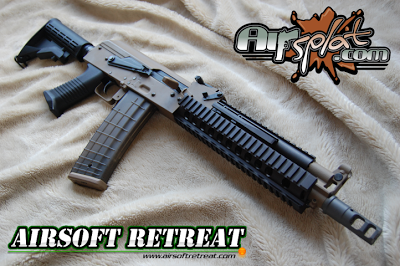 I ordered this AEG through Airsplat, who has it available HERE, priced at $189.99. This price more than qualifies it for Airsplat's free shipping deal, which uses UPS Ground only requires you to order $89 worth of stuff to qualify. The gun arrived a few days after ordering with no shipping damage that I could find. So, what exactly is this gun? This AEG is a full metal AK based replica, utilizing an AK105 front end, shortened barrel, full length rail system, railed gas tube, and a collapsible M4 type stock. It has some very unique external features including ambidextrous mock charging handles, and ergonomic pistol grip, and the availability of two colors, black and tan. It's a CQB oriented gun, due to the shortened outer barrel, but the thing performs well enough to be used in practically all environments. Surprise surprise, the gun arrived in a cardboard box! Inside this box was a medium density flexible foam liner (high class!) which kept everything nice and safe during shipping. It actually arrived partially disassembled, requiring you to install the mock charging handles and top cover before use, but it's nothing too crazy. The box art consists of a single sticker on the top of the box that makes no false claims as to what gun inspired it. Box art... Wonder where the inspiration came from? Along with the gun itself, JG included an 8.4v stick battery, trickle charger, a small bag of BBs, and a cleaning/unjamming rod. It's nothing too crazy, but I did find that the battery was certainly usable for some light skirmish usage. Please note that the gun comes equipped with an orange plastic AKS74U type flashhider attached from the factory, and that I've swapped it out for a different model for the review. This AEG comes with a very well made body, consisting of a stamped steel body, anodized front rails, metal trunion assembly, and high quality polymer furniture. When looking at the total package, the thing is really higher quality than its price suggests, as you rarely see quality like this in a sub $200 gun. Starting with the back, you'll notice the LE style, M4 type stock, which adjusts to fit different users. The metal buffer tube has 6 locking positions, and is able to fit aftermarket stocks without issue. It's quite solid, with very little wobble from side to side in any position. One thing to note, there is no sling mount on the stock adapter, like some other models, so running a single point sling will require modification. Moving forward from the stock, you'll hit the stamped steel receiver, which on my model, is finished in a lovely tan color. The paint seems to be high quality with no visible runs or defects, however, like most painted AKs, the selector switch does rub a line in the paint. On the left side of the receiver, you would normally see a side scope mount, however, in keeping with the real steel inspiration, there is no mount to be found. The controls are standard AK controls, consisting of a right sided selector switch in the traditional AK safe-full-semi pattern, and a magazine release mounted at the front of the trigger guard. The pistol grip is a SAW/FAL type unit, which is quite comfortable and has deep grooves in it to keep your grip solid. The charging handle is a great replica of the real one, with dual ACR type handles located on either side of the receiver. The handles pull back quite far, fully opening the mock ejection port. The battery compartment is located under the top cover, and you need to be a little bit careful about how you place your battery in there to prevent damage from the charging handle. It will fit a stick type battery or similarly sized/shaped LiPo, which I have no issues running this gun on. I'm exclusively using a Tenergy 11.1v LiPo in this and haven't seen any issues yet. Moving forward from the receiver, you'll find the Ultimak style scout and lower rails. The top rail is part of the faux gas tube, and is bolted on very solidly. The lower is the full length rail system that goes all the way to the front sight. The lower rail locks in at the receiver and uses two large mounting loops at the front to keep it damn solid. Both rails appear to be anodized, so the finish should last, well, forever. At the very front, you'll notice the AK105 type gas block/front sight assembly. The gun utilizes a threaded outer barrel, as opposed to a threaded gas block, with the former being the more secure system. The gun includes a completely orange plastic AKS74U type flashhider which I promptly removed and replaced with a Surefire type unit. The barrel threading is standard 14mm-, so adding muzzle devices is a piece of cake. Aiming this replica is an easy task as you're given standard AK type front and rear iron sights, as well as the railed gas tube for mounting optics. The sights are black, nicely contrasting with the tan trunion and gas block, and they are both adjustable for range and elevation. The top rail is mounted low in relation to the sights, but when used with an optic like the Aimpoint T1, you have a PERFECT view. There are absolutely zero trademarks to speak of on this gun, in fact, the only marks on the gun were on a safety warning sticker on the side of the receiver. This sticker proved to be the bane of my existence as it did not come off clean, leaving behind a nice little bit of residue that I'm still getting off. The included magazine holds about 500 rounds and does a good job of replicating the correct magazine for the gun. It is translucent and shows the inner winding mechanism through the sides of the magazine body. It's a VERY tight fit into the receiver, especially at the front lug, however, you can use other AK mags in the gun without issue. Other AK mags fit a little looser, but they all feed just fine. I was really pleased to hear how well this thing shoots with a Tenergy 11.1v 1000 mAh 20C LiPo battery. There is very little delay between shots on semi-auto, and the rate of fire was quite nice. I was easily getting 21 RPS on this medium output LiPo pack. With the stock 8.4v stick pack, your rate of fire is right around 14 RPS, which isn't great, but you can certainly run with it. Range and accuracy were more than acceptable as well. Given the fact that this gun uses a short 10" outer barrel, it's obviously skewed towards CQB use, but I was easily able to achieve hits on my torso sized target at 145'. Side to side deviation became a problem at that range, so I'm going to drop in an H-hop nub to see how it fares. Accessing the gearbox is pretty simple by AK standards, however, to get the inner barrel out, you may need to remove the front end from the receiver. This is easily accomplished by tapping out the large pin that goes through the trunion block and loosening the hex screw underneath the rear sight. Once the gearbox has been removed, you'll notice a few things right away. First off, the motor has damn strong magnets in it. The thing pulled screws from across the table to it. The rest of the electrics look to be pretty standard, with decent wiring, a compact fuse holder, and standard trigger components. The next thing I noticed was that this gun came with nylon bushings. I haven't seen nylon bushings in a stock AEG in a LONG time. They appear to be 7mm, so swapping them out for metal units will be easy, but I'm just not sure why they went with nylon in the first place. One thing to note, the nylon bushings are probably a large reason that the gun sounds as good as it does when it shoots, as nylon bushings are generally quieter. Inside the gearbox, the surprises keep coming, and they're not all great. The piston is a fully nylon constructed unit, but it has an amazing airseal with the cylinder components. The cylinder is a chromed Type 1 ported unit which is fitted onto a nylon cylinder head. The spring guide is made of metal and is one solid chunk, no bearings or other fanciness. The gears were a bit of a let down, as they appeared to be a zinc alloy, which is not the best for high strength. They were decently lubricated, and shimming didn't seem to be an issue, but I would keep an eye on them if you intend to run a LiPo long term. The inner barrel appears to be a 363mm unit, so tightbore upgrades are a piece of cake. The hop-up has a polymer housing and is a TM type unit that screws onto the outer barrel using two small screws. The sliding lever adjusts well and holds your desired position without issue. The outer barrel has a nice crown and is made of brass, but I can't comment as to the inner diameter with my tools at hand. In my case, I felt this gun just needed a slight extra sprinkling of tacticool to make it truly awesome. I added a CTR stock, T1 type optic, Surefire type flashhider, Magpul AFG, and J-Rich M600C light mounted on a GG&G 90* angle adapter, to bring it higher and tighter along the sightline. I also plan on swapping over my extended magazine release and selector switch from my Javelin tactical AK to make it a little bit more user friendly. Full metal, sub $200 MAG-K project starter gun! As I mentioned at the beginning of this review, I'm a huge fan of tactical AK replicas, especially this particular model. As it sits, the thing looks fantastic, but with the addition of a few relatively inexpensive parts, you can have a great MAG-K replica. It shoots extremely well, sounds great when firing, and the full metal, stamped steel construction should stand the test of time. Internally, it may need a little love down the line, but for now, at stock power levels and with a mild battery, it should run for a good long time before needing to be opened up. It's great to see an affordable AEG of this caliber hit the market, and even better when a retailer like Airsplat is able to pick it up before it even really gets out on the overseas market! 1. Would a 9.6v 1600 Mah stick fit? 2. Did it end up having 7mm bushings? 1. Provided it's a mini-sized cell, it'll fit a 9.6v stick pack just fine. 2. They look like 7mm bushings to me, but unfortunately, I wasn't able to get my micrometers on them when I had the gearbox out. I'll see if I can get them measured up in the next day or so. Just a little FYI. If you try to fit a ASG ultimate hop-up unit, the C-Clip won't fit. ASG made it larger and with a square outer section. You can still fit this hop unit, just have to file some material from the outside of the C-clip.